One of the most interesting things about running mist nets to capture birds for banding is that any given net may be the source of a surprise. As we unfurl nets at Hilton Pond Center from April through October, we always hope to snare a Ruby-throated Hummingbird or two, but during migration our net checks may produce colorful warblers or fat-laden thrushes on their way to or from their breeding grounds; among our rarest species have been three Connecticut Warblers, one Black-billed Cuckoo, and a Philadelphia Vireo. Since mist nets are non-selective, we really never know what to expect, and occasionally what we find in a net isn't a bird at all. Several times we've encountered Black Ratsnakes wrapped in mesh a little too snug for them to slither through, and once we even caught an Eastern Box Turtle in a net that drooped to the ground. And, of course, in autumn we spend hours removing thousands of dead leaves that fall into nets as trees drop their foliage, and this week we even caught a leaf containing a cat. 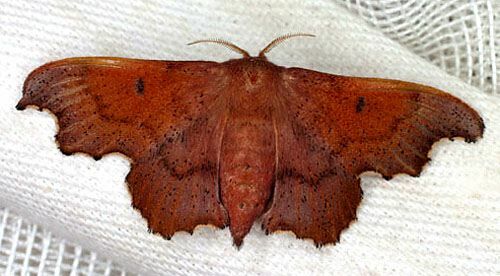 To clarify, what we actually netted was a leaf with a CATerpillar--"cat" being the nickname lepidopterists bestow on larvae of butterflies and moths. As a result we offer you a "cat tale." One evening this week we were furling our nets for the night--lest we capture bats and beetles and other nocturnal beasties. Prior to closure we always pick out leaves and sticks and other debris that may have accumulated, and in doing so we noticed in one net an inch-long piece of oak leaf caught in some of the mesh. We flicked at it--which usually sends such foliage flying--but this particular debris stuck fast, requiring we take it between thumb and forefinger to pull it loose. When we did that we noticed it was no ordinary leaf fragment; in fact, it was TWO pieces of leaf stuck together to make a structure about three-eighths of an inch thick (above). Our first thought in the waning light was we had just collected some sort of insect shelter, so we finished closing our nets and took the artifact back to our lab for photos. Closer examination under a desk lamp bore out our suspicions--especially when we spied the brown head of a caterpillar peeking out one end of the leafy sandwich. The top leaf layer of the structure was loosely attached with fine stranmds of silk, so we easily peeled it back from the lower half. This revealed a little translucent pocket of tightly woven silk through which we could see the outline of a rather chubby caterpillar (above)--narrow at the anterior but much wider toward its posterior. As we handled the silken pocket, the cat began to emerge from one end. The brown head turned out to be variegated, and the skin on the anterior body segments was mostly smooth but folded over on itself like the hide of a Shar-pei dog. Short white hairs sparsely adorned the caterpillar's head and body. With a little prodding we were able to get the larva to exit its chamber, providing a better look at its body shape and coloration. 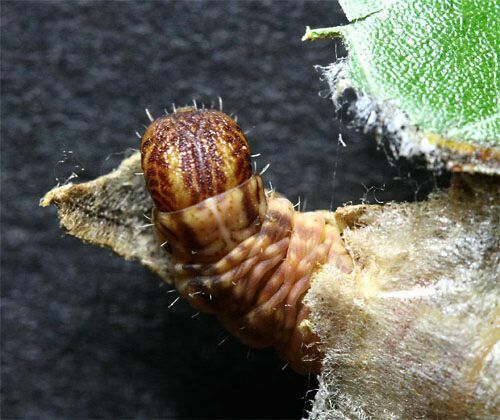 Dark at the head end, the caterpillar's epidermis became progressively lighter toward the posterior (above). On either side of each segment was a single dark dot with a pale center (below); these were spiracles--tiny pores connected to tracheal tubes that are part of the cat's respiratory system. 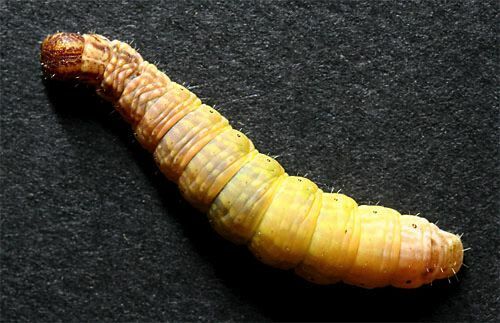 Although we'd never seen this particular caterpillar before, its shape and coloration--along with the structure that contained it--gave us the info we need to identify it to species. We turned to David L. Wagner's Caterpillars of Eastern North America, a superb photographic guide to moth and butterfly larvae, and looked for a match. It wasn't long before we came to a photo that resembled our larva--and to a name perfectly descriptive of what we had found in the mist net: Scalloped Sack-bearer, Lacosoma chiridota. The Scalloped Sac-bearer caterpillar occurs from southern Canada to Florida and west to Texas, where it dines on various species of oak. 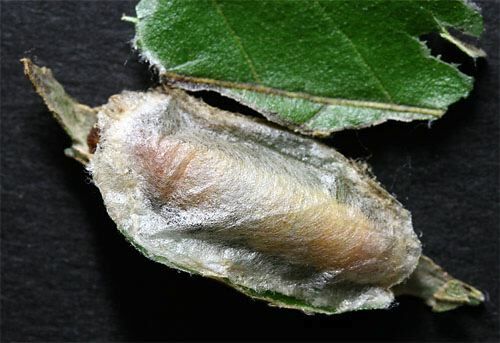 In its younger stages, the cat simply spins a small silken tent under which it resides as it munches on a leaf, but older instars build the structure we found--a tightly woven pocket protected top and bottom by irregularly shaped fragments from two or more leaves. 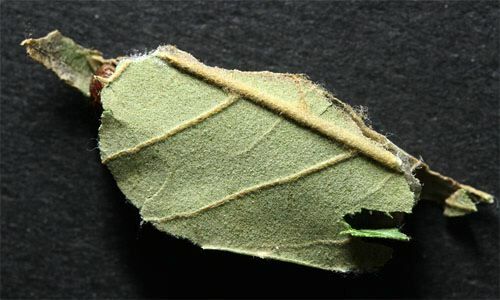 Larvae of the Sack-bearer Family (Mimallonidae) tend to eat mature, thick oak leaves that are too tough for other cats. The interesting thing is that the sack-bearing cat is able to tote its leafy shelter, moving from twig to twig in the oak and dining on whatever foliage pleases its palate. When we finished photographing the caterpillar, we placed it into a bowl with some fresh oak leaves. The cat promptly rolled one leaf over itself, tacked down the edges with silk, and instantly had itself another portable shelter. Next day we put the Scalloped Sack-bearer caterpillar and its newly manufactured mobile home under the oak tree whence it came, confident this "cat tale" from Hilton Pond Center will finally end when the larva forms a pupa and then emerges as a rusty-colored scallop-winged adult moth like the one in the photo above. Maybe that moth will become the next surprise we find in one of our mist nets. 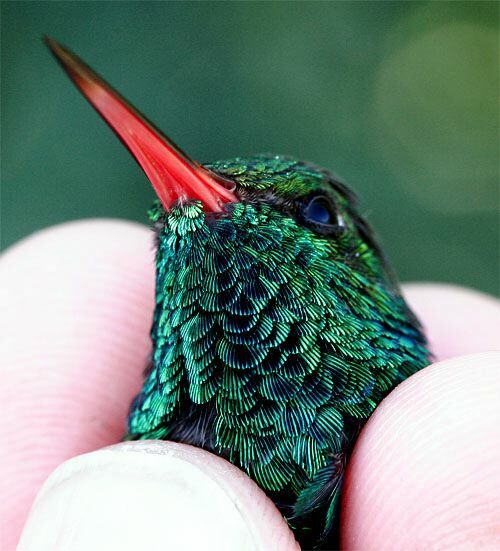 If you ever shop on-line, you may be interested in becoming a member of iGive, through which nearly 700 on-line stores from Barnes and Noble to Lands' End will donate a percentage of your purchase price in support of Hilton Pond Center and Operation RubyThroat. For every new member who signs up and makes an on-line purchase iGive will donate an ADDITIONAL $5 to the Center. Please sign up by going to the iGive Web site. It's a painless, important way for YOU to support our work in conservation, education, and research. 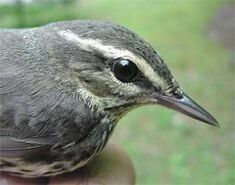 A buffy eyeline and spots on the throat differentiate this species from the Louisiana Waterthrush (white eyline and clear throat). --Early fall migrants began moving through this week, and we were able to mist net a few of them at Hilton Pond Center (see list at left). Although some of the individuals listed may have been produced locally, we suspect we would have netted them before now if that were the case. The only "guaranteed" migrants are probably the Veery, Northern Waterthrush (photo, below left), and Ovenbird, but we bet many of the Ruby-throated Hummingbirds came from somewhere north of us. --We were pleased this week when Craig Tufts, long-time chief naturalist for the National Wildlife Federation, spent a few days with us at Hilton Pond Center. We've known Craig for years and renewed our friendship in the summer of 2005 when we taught together at NWF's Family Summit in New Brunswick. One thing we mentioned to Craig during his recent visit is that folks often ask how we keep coming up with new topics to photograph and write about for our "This Week at Hilton Pond" installments--especially since the property is "only" 11 acres. After walking the trails and observing the local diversity of Piedmont flora and fauna, Craig's comment was: "I'd say you have a hundred years of material to write about . . . and with climate change, perhaps another 300." Makes us yearn for a longevity pill. --It finally rained. On 14 Sep, 1.4" of water collected in the Center's trusty rain gauge. It's about time.